We supply quality Double walled Water Baths with Thermostat control or Digital control to meet the needs of various industry. These waterbaths are manufactured from quality stainless steel sheets and ensures smooth finish and safe and leak proof. 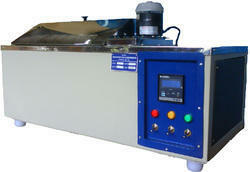 Water Baths are available in two models with 6 openings or 12 openings to meet the customer requirement. These ThermoStatic Water Baths are double walled made with high quality heavy guage stainless steel. The gap between the inner and outer walls is insulated with fine quality glasswool. The bath is fitted with immersion heater. Temperature is controlled by a thermostat from ambient to 90 deg c. The bath is provided with pilot lamps, concentric rings, power chord and drain plug. Double walled chamber, fully stainless steel. The interspace between the walls is tightly packed with special grade glasswool to eliminate radiation heat loss to the minimum. Pyramid shaped cover fitted with plastic knob is provided .A drain plug is fitted to drain out used water and easy cleaning of inner chamber. The inner chamber is fitted with immersion type heating element and covered with perforated removable diffuser tray. The Temperature is controlled by thermostat.